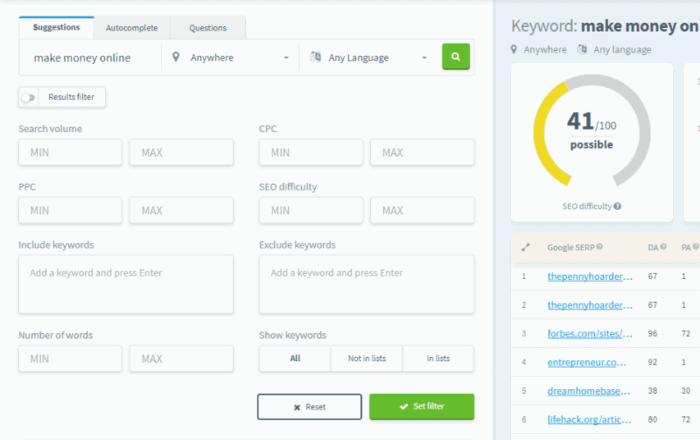 If you're looking for a keyword research tool to dig in profitable long tail keywords that are easier to rank, KWFinder is what you need. KWFinder is one of those keyword research tools that eases your keyword research and helps you find long tail keywords that have low competition and are easier to rank. KWFinder makes it easier for me to find low competition keywords, get the exact search volume, accurate keyword difficulty score and low competition LSI keywords & more. There are a lot of filters and other features that helps to find keywords that do not take time to rank. Check the detailed KWFinder review 2019 below to find out more pros & cons of KWFinder. KWFinder is one of the best keyword research tools I’ve come across. 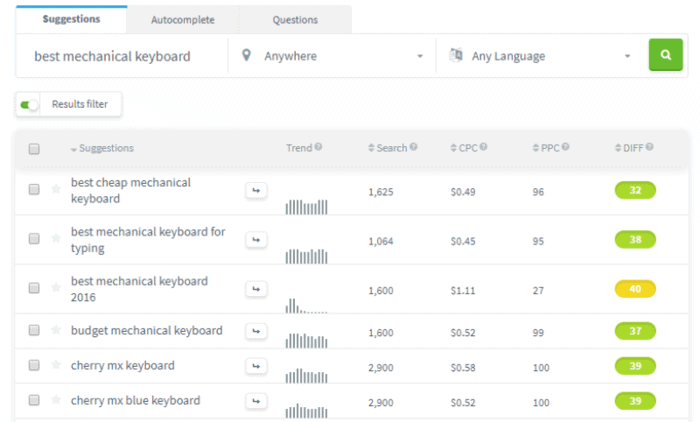 You get keyword filter, auto-suggest options, find real-time question keywords. The SERP analysis and keyword difficulty score is also as accurate as manual calculation. KWFinder isn’t the cheapest tool but definitely not the priciest keyword research tool. The chat is always offline. They have email support but who has the time these days. For such a premium pricing, I’d love to see a live chat service. You already know how important keyword research is to your blogging success. It helps you figure out what people are actually searching for and which terms you might be able to rank for.It’s a must-have if you want your site to besuccessful. Before proceeding for the detailed KWFinder review, here is what KWFinder is all about (in case you’ve no idea). 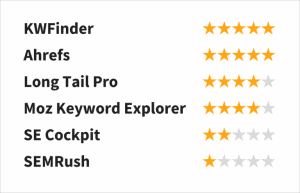 KWFinder is one of those keyword research tools that I hesitantly tried the free version and never returned back to my old, laggy and now not-showing-keyword-search-volume tool called Long Tail pro. I have of course tried Ahrefs in between and as much as I love it as a SEO tool, the keyword research is pretty average. KWFinder keyword research tool is developed by Mangools who are relatively new in the keyword research market but the recent goof by Long Tail Pro not showing keyword search volume and taking almost eternity to load a keyword report made KWFinder ahot cake in the market. KWFinder manages to brilliantly walk the line between depth of data and ease of use. That is, whether you’re a beginner or a pro, you should be able to use KWFinder to help you find rankable keywords. In my KWFinder review 2019, I’ll give you a look at the various ways in which KWFinder can help you perform keyword research, as well as some of the few areas where it falls short of its competition.And I’ll also show you a real example of how you can use KWFinder to find rankable keywords for your very own websites. In general, I’m a big fan of KWFinder and use it for my personal/commercial projects. By the end of this review, you should understand just why that is. On to the detailed review of KWFinder 2019 (Click here to skip this and jump to the KWFinder Discount coupon). KWFinder Pricing Review 2019: How Much Does KWFinder Cost? While we can manually analyze the SERPs using basic tools like the Moz extension and other manual calculations, I prefer doing things smart. This old method is good for analyzing a certain keyword once in a while. Find other long tail keywords related to the seed keyword (If you’re into blogging seriously, you’ll know that real profitable and easy-to-rank keywords are always deep inside the seed keyword. And an automated, near-accurate calculation of the keyword difficulty score. And, KWFinder is the one that does this efficiently without lags and affordably. Suggestions – this is what most people expect from a keyword research tool. Like the Google AdWords Keyword Explorer, Suggestions brings in related searches that tie to the keyword you entered. Questions – pulls in queries that start with question words, e.g. “how”, “what”, etc. I’ll give you a quick look at these three methods using a generic keyword like “make money online” – then I’ll show you how you can actually use KWFinder to find rankable keywords for your own sites. When you search Suggestions, you’ll get an amalgam of various related keywords. Again, these options are similar to what you might get from the AdWords Keyword Explorer in concept. The interface for an Autocomplete search is identical – the only difference is in which keywords KWFinder returns. What’s interesting about Autocomplete is that it seems to be based, in part, on your geographic location. I wonder if this is because KWFinder relies on your own browser to pull from the Google API. In all of the examples above, you may have noticed the drop-downs beside the keyword. Those drop-downs, combined with the Results filter, give you a good deal of control over the results that KWFinder returns. Location – lets you base the suggestions and search volumes on an actual country’s searching habits. If you’re specifically targeting a country, you’ll want to use that country’s actual search data. Language – lets you restrict the results based on a certain language. 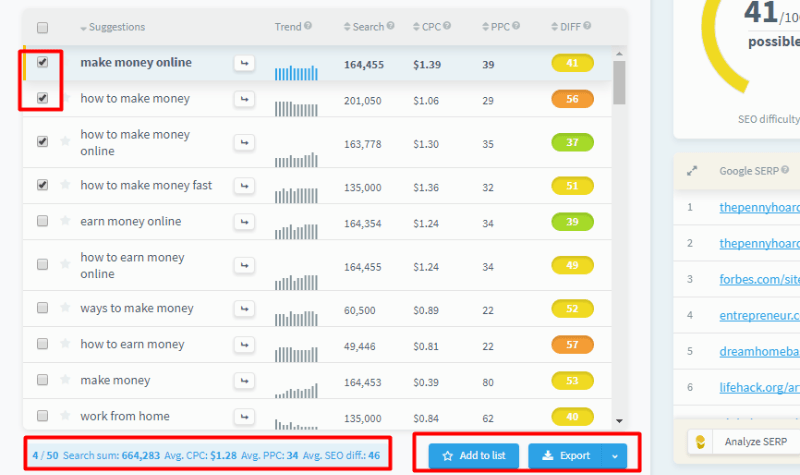 Set minimums and maximums for search volume, CPC, PPC, and SEO difficulty. This is helpful to, say, exclude keywords that you have zero chance of ranking for. Include or exclude certain keywords from the results. You can use these to really drill-down on user intent. Specify a minimum or maximum number of words. This is helpful to either force or ignore longtail keywords. Exclude or include keywords that are already in your lists. More on lists later! Best of all, you can combine more than one filter at the same time to really get targeted keywords. Finding keywords is only helpful if you can actually rank your website for those keywords, right? That is, the juiciest keyword in the world doesn’t help if your site will never even sniff the first page. I love how it’s color-coded so you can quickly grasp how easy it is to rank for a certain keyword. Is it perfect? Well, until Google gives up its algorithm, you’re unlikely to find a tool that offers perfect keyword difficulty. KWFinder’s SEO Difficulty score is actually based on Majestic’s data, so it’s about as accurate as you’re going to get in this world of imperfect information. Actually, the example keyword that I chose is one of KWFinder’s poorest showings. 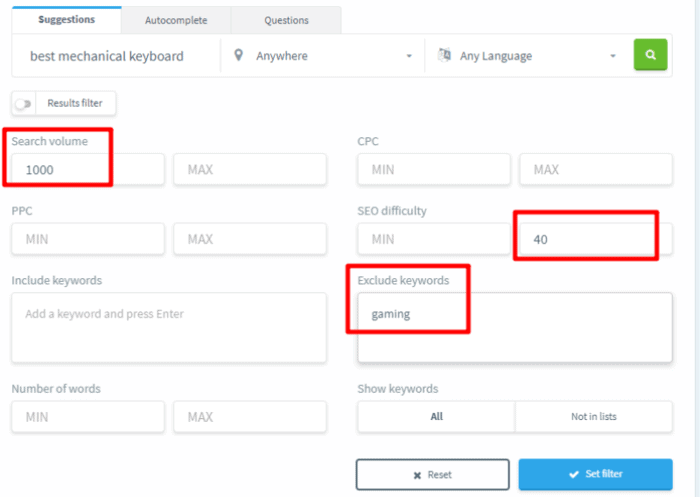 There’s no way that “make money online” should have a 41 keyword difficulty. ButKWFinder fares much better on other queries (more on that in a second!). I’ve used its difficulty score to rank first for some profitable terms with minimal effort. And while it’s still no replacement for gauging difficulty manually (no tool is, in my opinion), it does a good job of at least pointing you in the right direction when it comes to difficulty…most of the time. And… Don’t just take my word for it! In the latest extensive research conducted by my friends over at Authority Hacker, they found KWFinder’s keyword difficulty score was the best out of the top 6 keyword research tools (KWFinder, Ahrefs, Long Tal Pro, Moz Keyword Explorer, SE Cockpit, & SEMrush) they tried. Shows you basic metrics about each page that’s currently ranking. This can help you do the manual keyword difficulty research that I mentioned above. Gives you an estimated number of visits for each position, based on CTR stats for various organic rankings. This is more helpful than raw search volume because you can get a rough idea how much traffic you’ll actually get for each position in the SERPs. Adds a difficulty rank for each individual site. Again, this isn’t perfect (there’s no way The Penny Hoarder deserves a 17). But it is usually a good start. As with the Keyword difficulty tool, I still encourage you to do some further manual research for important keywords. But that’s not a criticism of KWFinder specifically – I think this advice applies to every single keyword research tool in existence. In the above sections, I’vetoldyou about what KWFinder can do. But, this KWFinder review would be incomplete without me showing you the exact case study or how you can use it to dig in real profitable keywords that have buyer intent. Let’s say that you want to write a post selling “mechanical keyboards”. I’m in love with my mechanical keyboard, so this topic is near and dear to my heart! You see that keyword gets over 14,000 monthly searches. Pretty cool, right? Ehhh, not really.Look at that keyword difficulty score. 60? That’s pretty tough. So unless you’ve got one awesome authority site, you probably aren’t going to sniff the top of the SERPs for that keyword. Success! Gone are the likes of The Wire Cutter and PC Mag, replaced by a bunch of sites you’ve probably never heard of. That means you have a chance to actually rank for what may well be a profitable keyword! Quickly going from “initial keyword idea” to “actually attainable and profitable keyword” is what makes KWFinder so dang helpful. And if you’re not as interested in buying keywords, you could also use theQuestions function to find similarly rankable informational queries by applying a similar process. Let’s say you find some juicy keywords that you’re interested in. How do you save those keywords for later? This is helpful because most of the time, you’re doing keyword research to shape future strategy. If you can’t easily come back and access your keywords again, you’re going to have to duplicate your work…which isn’t very fun. Personally, I’m a big fan of using Lists because I don’t need to bother keeping track of a bunch of different CSV files. Instead, everything is always right there in my KWFinder account. Next on in the KWFinder review 2019, is the section where we review the pricing plans of KWFinder. If you register for an account, you can search for up to 5 keywords per 24 hour period for free. The free plan also limits the number of related keywords, which makes the data not quite as detailed as the paid plans. If you’re just a casual blogger, that might be all you need. But if you’re doing lots of keyword research, you’re definitely going to find the limited results and 5 keyword maximum onerous. KWFinder costs you$23/mo(when paid annually) which is after adding my KWFinder discount coupon of 20%. This is very much affordable and budget-friendly based on the benefits you get and based on what other keyword research tools or KWFinder competitors charge. 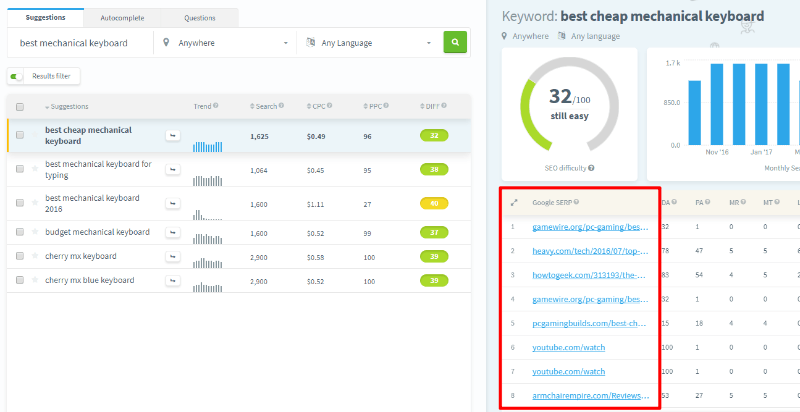 If you’re serious into blogging and want to uncover hidden profitable keywords (that not only help you rank easily but also have greater targeted buyerintent)instantly, you should definitely opt for the paid version. Afterall, an investment for your blogging business is something that will bring you great ROI and take it further. Let’s now compare KWFinder pricing with other KWFinder alternatives. KWfinder is a lot cheaper than its closest competitor, Long Tail Pro. Long tail pro costs you $300 per year for the starter plan and the pro plan needs you to shed $500 per year to get your hands on it. KWFinder at $279 per yearis a steal deal I must say. Keywordtool.io is far more heavily priced than what it has to offer and as compared to its competitors KWFinder and Long Tail Pro. It costs around $68 per month. I would never recommend you to try anything of that sort when you can get your hands on an even better KWFinder at $23 per month which still has higher plans if you need more resources. 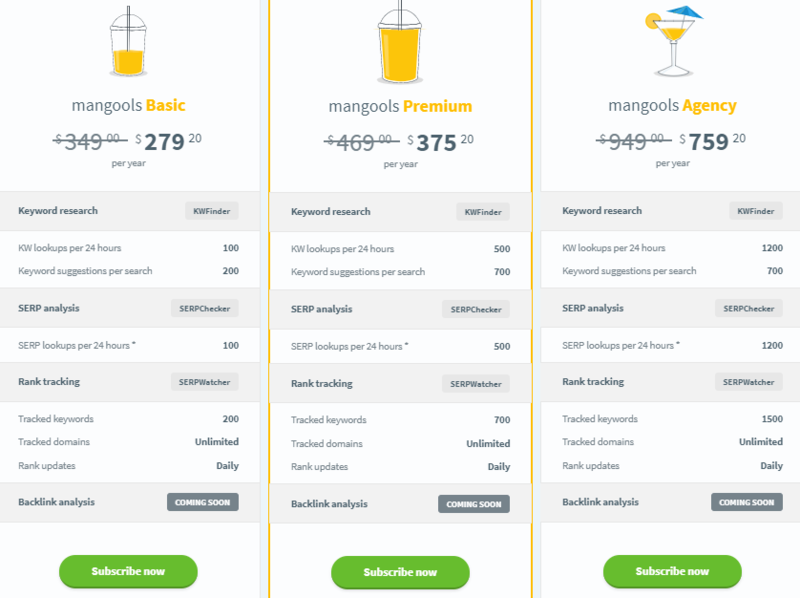 Quick Note:The pricing of Mangool’s KWFinder isn’t for the sole keyword research tool, you get access to 3 more of Mangool’s SEO tool with the same pricing bundle. 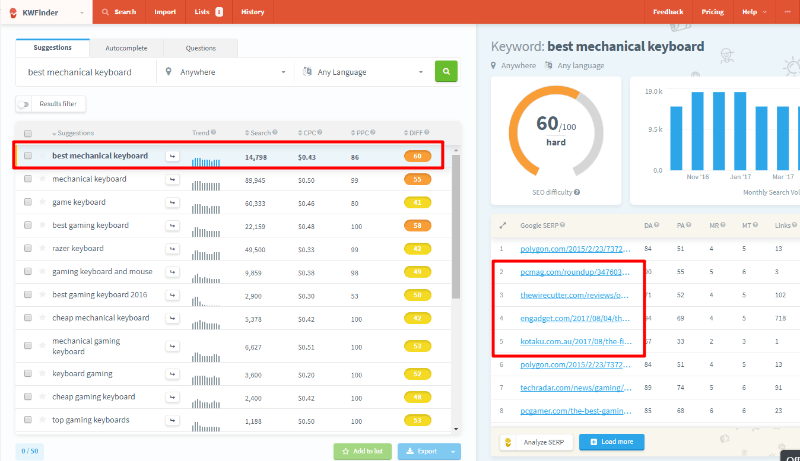 Each paid plan also gives you access to Mangools’ SERPChecker (the SERP analysis feature I showed you above) and SERPWatcher (keyword rank tracking tool very helpful to see how the keywords you’re targeting are performing on the SERPs). The review and discussion about these tools individually is not within the scope of this KWFinder review, so I will separately review them in an upcoming article. Looking for KWFinder discount coupons? KWFinder already has a hefty 44% discount by default when you subscribe for their annual plan. If this isn’t enough,I as their official affiliate partner,bring you another20% discount coupon on KWFinder.You can access this by clicking on any KWFinder link/button on this page or the image below. So, you get a grand total of64% Discount on KWFInder which is a killer deal to have in your blogging arsenal. As this is an unbiased review of KWFinder, here are the pros and cons of KWFinder. In the end, I think KWFinder’s pros definitely outweigh its small list of cons. The interface is plain gorgeous. I think it’s the best-designed interface of any keyword research tool. It gives you 3 different ways to research keywords. 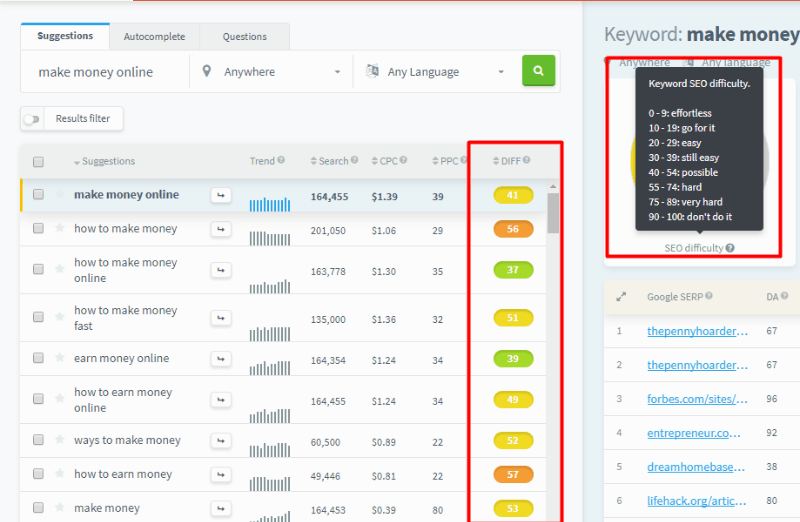 And most importantly – KWFinder helps you actually find profitable AND rankable keywords pretty dang quickly. 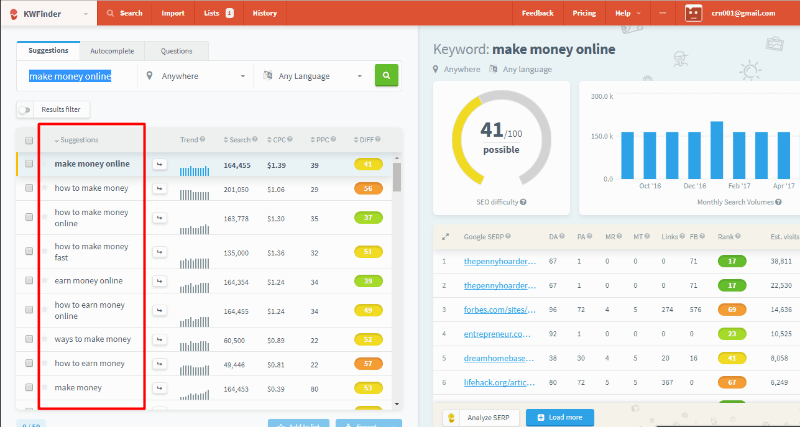 All in all, if you want a super user-friendly tool for keyword suggestions and non-competitor keyword research, I think you’ll love KWFinder for its amazing interface, quality search results, and for how easy KWFinder makes it to find profitable keywords. Did you like my unbiased and complete review of KWFinder? What are youruser reviews of KWFinderin case you’re already using it? Did it inspire you to take action and build a profitable blog? I am sorry for the inconvenience. Please try now, the KWFinder coupon code is working. “digitalgyd” works now. old keyword helper tool the Longtail pro. KWfinder the problem would be eradicating. The detailed post of yours is so much helping and the screen shots you provided here is of great help. 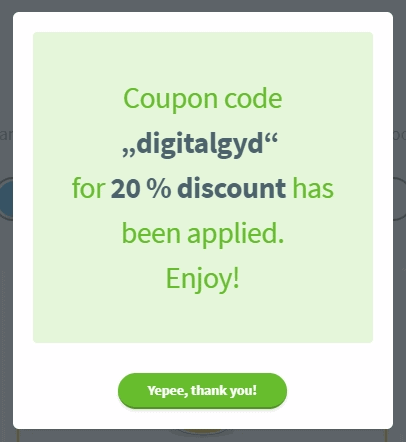 Great to have the 20% discount coupon over here and I am going right away for this awesome keyword finder tool.